Making it Rain Tests: Are The New SmarterBalanced Exams Invalid? Inaccurate? So it seems we have a situation where millions of dollars of public tax dollars and countless hours of wasted instructional time have just been spent on scores that will likely be meaningless, and that the general public has been led to believe are accurate indicators of learning and skill. For an example of what a “score report” is proposed to look like, download a sample here. In addition to the motivational fallout likely to occur with the vast majority of youth who are projected to fail the tests (according to the set “cut scores” by the SmarterBalanced Consortium), the majority of parents report not knowing about the new tests nor how they will be used. So here we have a situation where nearly 200 college and university representatives in six states have just signed on to using test scores from a deeply flawed, experimental test that lacks independently established validity/reliability, in order to determine a student’s access to either the regular college curriculum or a remedial track (with a much higher likelihood of dropout). Do students know about this? Readers are encouraged to check out Jon Pelto’s “Wait, What?” blog that captures excellent commentaries on SBAC: He wrote No, the Common Core SBAC Test is Not Like a Blood Test and More than 90% of English Language Learners Projected to Fail Common Core SBAC Test. 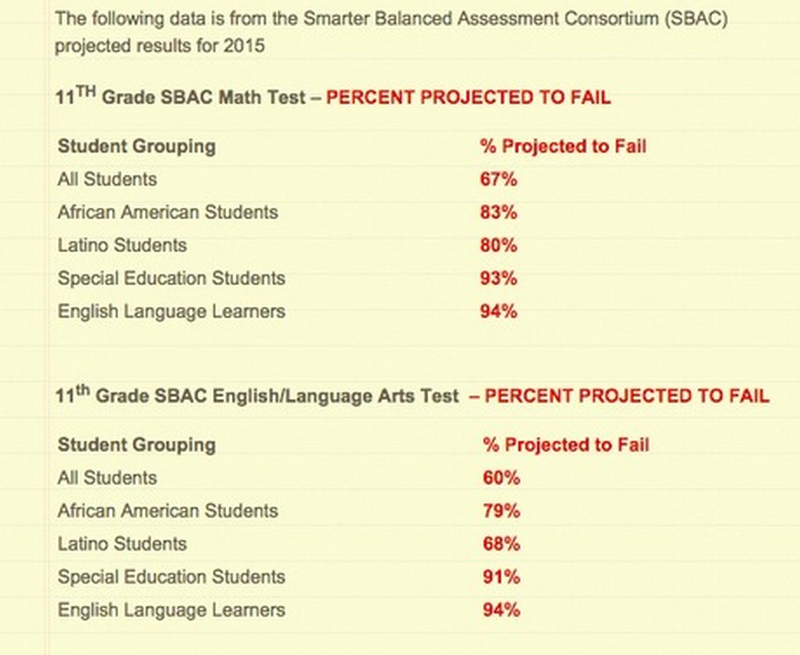 For a brief look at how the higher education news above will be likely to impact 11th graders who have just taken or are about to take the test check out the post Stamford principal climbs on SBAC Opt-Out abuse wagon. Check out her compendium of information about high stakes assessments at Testing, Testing, 1, 2, 3 below. For more on controversies surrounding the development and implementation of the Common Core, see Dewey, Testing Companies, and the Origin of the Common Core, for the Opt Out of testing movement, see Who’s the William Wallace of testing: @JessedHagopian or Liz King?, and on high-stakes testing, see Does High-Stakes Testing & Accountability= Social Justice & Civil Rights? For all of Cloaking Inequity’s posts on Common Core go here. I have a question: are the people pushing Common Core and all the testing subjecting their own kids to this stuff? Sidwell Friends, Lakeside, Chicago Lab School, the fancy private schools of Westchester and suburban New Jersey SF/LA, Chicago and DC?